My Card Attic: Lost Mojo & Finally A Card! Hi my lovely lovely friends! Just a fairly quick post today, to let you all know how Mum is progressing. First, I want to thank everyone who took the time to extend their well wishes, prayers and support for myself and my mother during this very worrying time. Here is a brief(ish) explanation of what went wrong. My mother had had a leg ulcer for months and had been prescribed at least four courses of antibiotics during that time and it had shown no signs of improvement. At the same time her GP had insisted that she attend the surgery twice a week to have it dressed. She had also been getting very muddled with appointments and had been getting very short of breath. Bottom line . . . she was rushed into hospital and it turned out that she has Chronic Heart Failure (for which there is no cure, just meds to ease the symptoms), she also has Sepsis, due to the very long running infection to her leg. The Sepsis is what was causing her confusion and Delirium (she had also been saying bizarre things, so the hospital did a scan of her brain, as they suspected Dementia or Alzheimers) However, they said that there was nothing wrong with her brain - thank God - and that it was all due to the Sepsis, which was causing Delirium & confusion! Her doctors has so much to answer for! I am happy to say that she is now in a nursing home for respite and recuperation and is gradually getting the treatment that she should have received from her doctors. We still have a very long way to go and I don't think that Mum will ever be able to manage totally alone, but she will - hopefully - have a certain degree of independence back. I am still sorting out so many things that had gone wrong, due to mum's confusion and am still attending the nursing home every day to ensure we are back on the right track, so my posts will still be very sporadic and I apologise for not being able to visit all your lovely blogs just yet, but as soon as I am able, I will! I just found a little time for myself yesterday evening and made this card. It's not one of my best, but I found that my mojo and motivation had deserted me, but I had realised I have a woeful shortage of get well cards and so wanted to make some for my stash. Here it is. I already had the fern stencilled on to the panel before my hiatus, so I just cut the bottom with a scalloped border die. 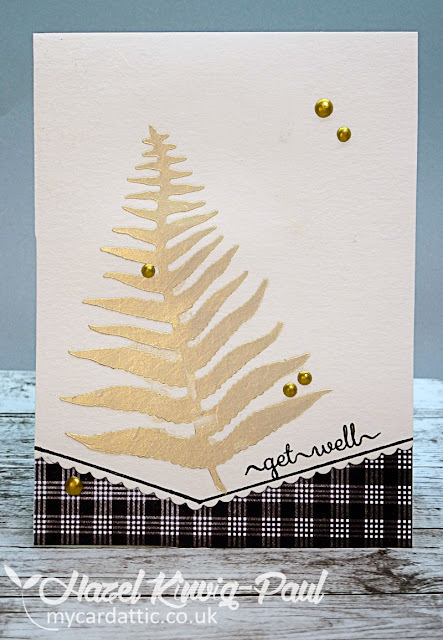 faced a card blank with the check paper and adhered the panel with some wet glue, stamped the greeting and to finish it off, I added some drawn lines to border it and a few drops of gold Nuvo Crystal drops to co-ordinate with the gold sheen of the pearlised embossing paste. 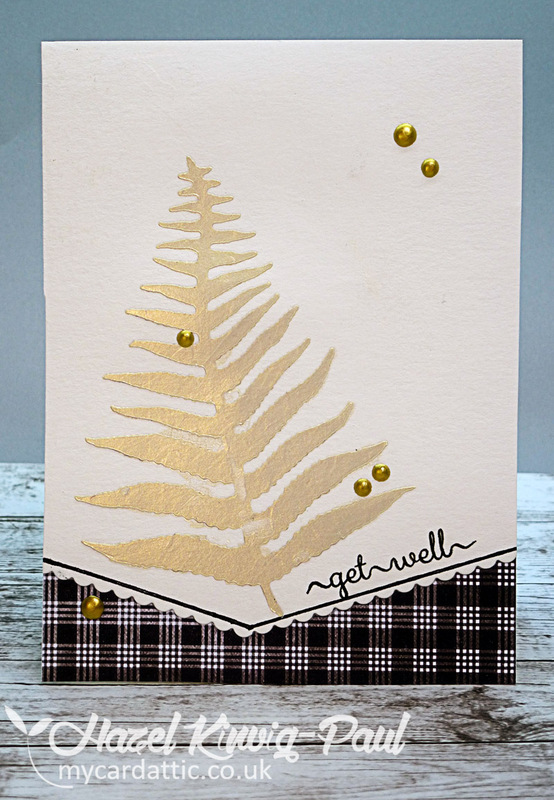 It is quite a beautiful card, I love the gold with your patterned paper and the embellishments are so perfectly placed. I am glad to hear how your mom is now getting the care she needs, it is frustrating, I am sure, to deal with the fact that these things were missed before. 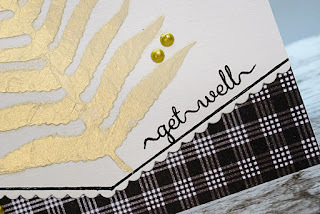 Well wishes! I am so glad your mom is doing better, Hazel. I am keeping you both in my prayers. I hope she is feeling better each day. 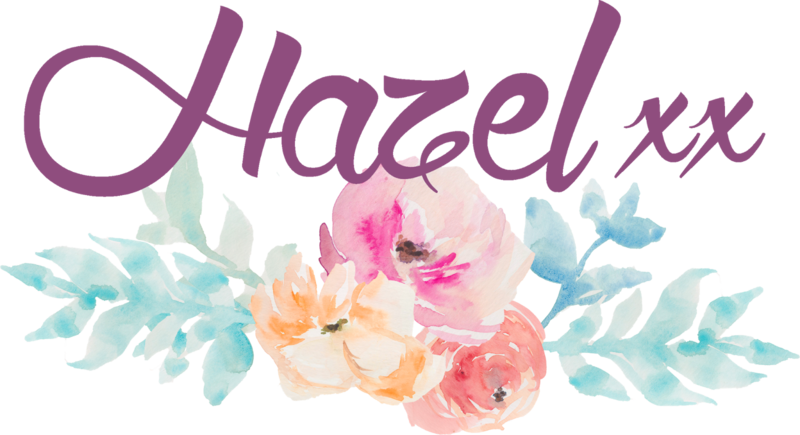 So beautiful Hazel....love your sweet design and sending good thoughts and prayers for you mom! 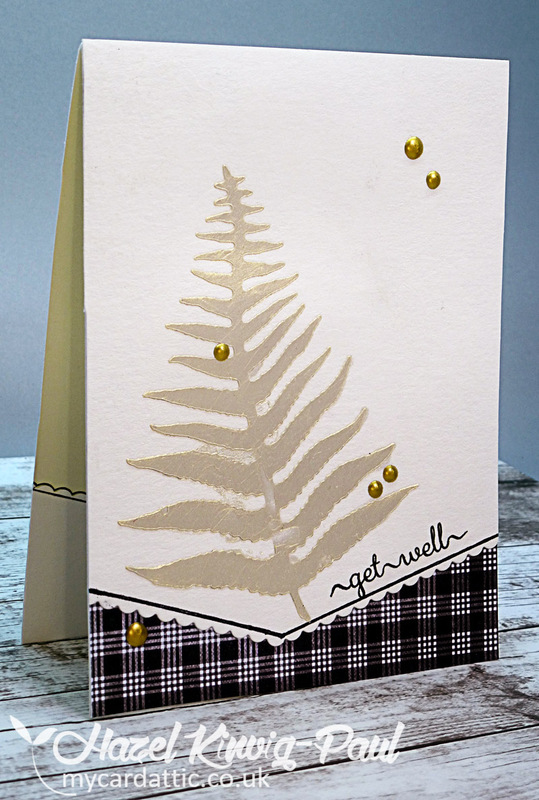 Beautiful card Hazel that is sure to bring a smile. 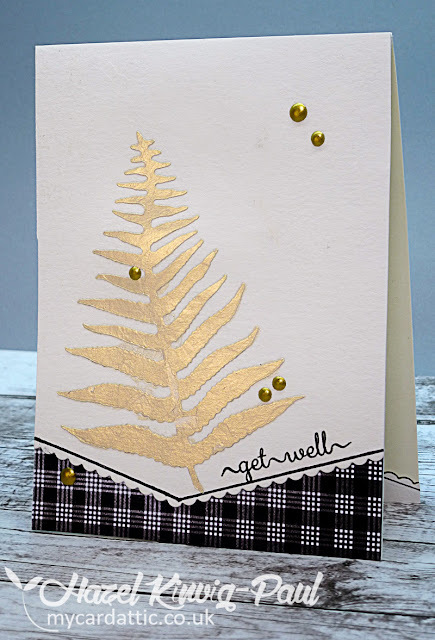 Love the gold embossed fern, and so pretty paired with the check paper. Lovely design. So happy to hear that your mom is getting the care she needs, and that things are progressing in the right direction. Your mom has been through so much ... and so have you. Don't worry about your mojo, it will return ... it just takes time after going through a stressful time. I totally can relate! Your card is lovely Hazel and it's good that you felt you had a little time to do some crafting. Your mojo will certainly return but at the moment you must have you head so full of other things. So sorry to hear that your mom and you are going through so much! You would think one could trust the doctors... So frustrating! Your mom is so lucky she has you to help and support! Glad to see that you found some time to create. Doesn't look to me that you lost your mojo, your card is just as fabulous as always! Hi Hazel . . . loving your gorgeous card. Sending well wishes to your Mum and also to you! Hope she makes a good recovery soon. I am glad to hear they have uncovered the medical layers and your mother is improving! Your card is beautiful. 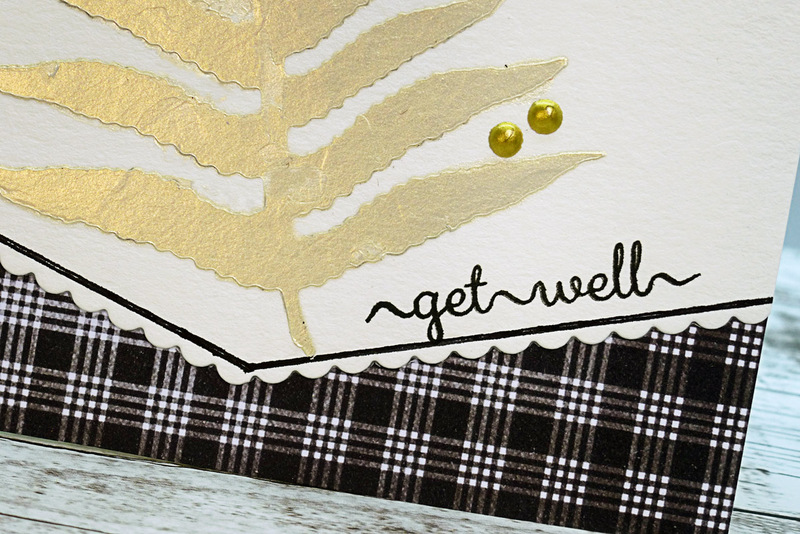 Love that gold leaf and your fancy bottom of the card! Best wishes for your mom and to you, also. Your card is beautiful. I'm glad you had a little time for card-making. Just saw your link at another blog, and it reminded me that we'd sort of lost touch when you went on your last holiday. Didn't know about all the tribulations with your Sweet Mom, but was happy to read that things are now more in hand, and she's getting the needed care. This kind of thing is SO upsetting. Thankfully she doesn't have the dementia that was feared, and that the other things can be treated so that she's not in discomfort. I bet you are just worn out! Loved your lovely gold fern silhouette with the pretty design style. The dark plaid added just the right touch of 'drama' to the white & gold. Rest up and we'll catch up when things calm down. My MoJo is hiding just now, for crafting and about anything else!! TFS & Hugs. Best to your Mom as well. So glad your Mum is on the mend and that she is getting the help she needs. Sounds like your still flat out getting everything in order, I hope your getting some rest too! !